Weatherwolde Castle is one of several castles that were built in Tujunga in the 1920s. Originally known as Chateau de Sales, the castle was built by Marcel X. Dumas and was modeled after a castle his family had owned in France. The property was later acquired by Jack T. Harris, who won it in a poker game in 1942 from a later owner. Harris’s wife, Dixie, worked for David O. Selznik, the creator of Gone With The Wind and the castle became the site of many celebrity gatherings. In 2005, the castle was sold to a developer who began the process of tearing it down. 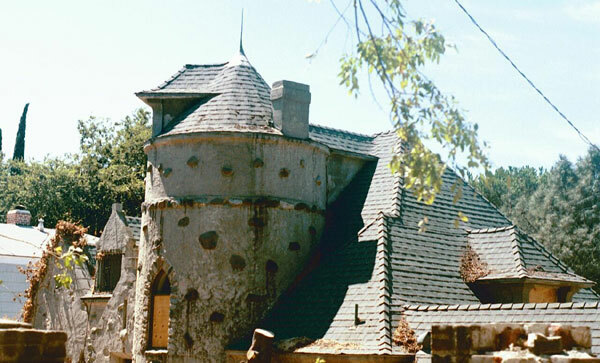 The Little Landers Historical Society in Tujunga nominated the castle to become a Historic Cultural Monument, but not before neighbors had stripped the building of all of its historic windows, doors, and other fixtures in order to prevent them from being destroyed. During the monument process, the castle was purchased by a preservation-minded buyer who, after long negotiations with the developer, closed escrow in December of 2005. Ninety-eight percent of the missing pieces have been returned to the castle and reinstalled, but the building still requires substantial restoration and the owner has applied through Charlie Fisher for a Mills Act contract that will provide the new owner a substantial savings in property taxes so that the money may be put toward repair and restoration of the building and the replacement of the gardens that were destroyed by the bulldozers. A true preservation success story.